Next Car goes the distance yet again and covers over 1,000 kilometres in another long distance road test. In Europe, the Ford Fiesta is big. Not physically, because at 3.950 metres long it is a light car, but in sales. Designed and manufactured in Germany, the little Ford is a constant top seller. And it has been that way for many, many years. But these days it is selling at an even higher rate. The new model Fiesta, known locally as the WS series, has been increasing Ford's sales in Europe all year long. In North America the Fiesta is presently the subject of a great deal of spin doctoring. 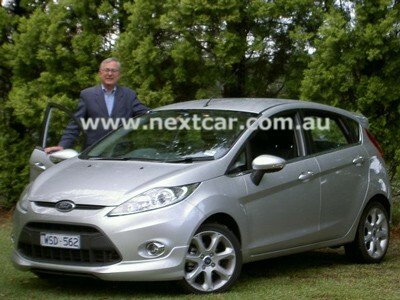 This will, no doubt, make the little Ford very popular in the lands of the very big utes when it is released there in early 2010. Although the Fiesta was released here in Australia early in the year with manual transmission, Ford has now released the Fiesta with automatic transmission. Our road test of the little Ford Fiesta is undertaken in the new automatic version, in the guise of the top of the line "Zetec" model. 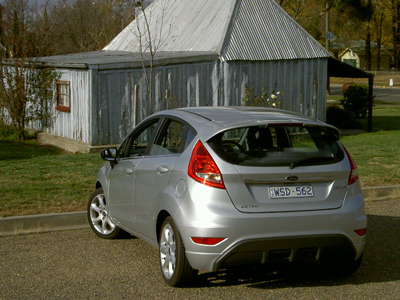 Not shy to let the new Fiesta go the distance, we drive it from Melbourne to Sydney and beyond. Covering some 1,247 kms we found Ford's new model quite an easy car to enjoy. Although we only had the car for three days, we managed to experience city and country driving conditions, together with plenty of exposure to highway and freeway travel. 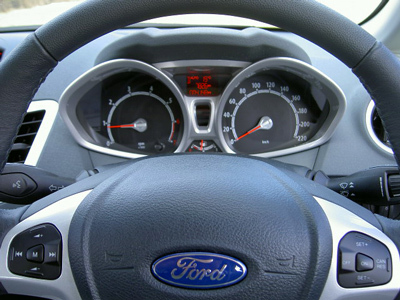 Ford's expectations of fuel usage is a miserly 6.9 litres per 100 kilometres on the commonly used "combined cycle". Unfortunately, I didn't manage anything close to that. By avoiding toll roads we seized the opportunity to experience early morning peak traffic conditions in Melbourne and late evening peak traffic in Sydney. But we need to accept most of the trip was on highway mode. Our average fuel consumption for the total trip came in at 7.3 litres per 100 kilometres. Whilst we didn't necessarily drive for economy, our driving style suggests a good fuel usage figure is traditionally obtained. Speeding doesn't come into the equation. That isn't the way of Next Car, as we evaluate cars just the way a buyer would drive a car (normal in other words). Whilst the manual Fiesta has a 1.6 litre four cylinder engine, the automatic version has a 1.4 litre DOHC engine producing 71 kW of power and 128 Nm of torque. This provides adequate power for the tiny Fiesta. The auto is a four speed unit. Driving the car was a definite delight. The light controls and very nice driving dynamics make for quite an enjoyable driving experience. The Ford Fiesta provides a very good ride with the steering, braking (front discs, rear drums), suspension and handling working 'just right' thus demonstrating its European design. The sound proofing seemed just right as well. 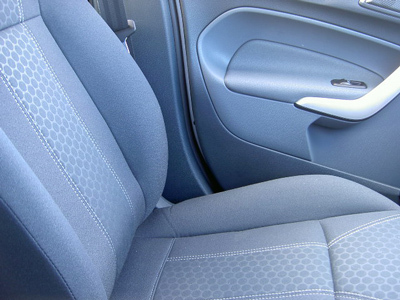 The attractive interior of the Ford Fiesta Zetec is comforting to both the eye and the body. One 'leg' of our trip was just on a thousand kilometres, stopping only for food, fuel, photos and the inevitable response to the call of nature. Yet, even after such a long drive, my body had not tired. Thus the adage of stop, revive, survive is reinforced by the experience of this trip. As suggested, the seating was attractive and the lay-out of the interior is thoughtful. Shallow door pockets in the front door trim are long and wide enough to be quite handy. There are steering wheel mounted controls and the steering wheel itself adjusts up/down and in/out. There is a driver's footrest and there are a multitude of storage spaces upfront for cups, mobile telephone and ticket/card or the like. The back seat is pleasing when it comes to occupant space. Bear in mind, expectations for back seat occupants should be low in such a tiny car. Yet the Fiesta won't cramp the style of two average sized adults in the rear, whilst there is ample room for three youngsters in the back. Luggage space is reasonable for such a tiny car. Standard equipment for the Fiesta Zetec includes (but isn't limited to) 4 x 16" alloy wheels (spare is a 14" temporary type steel wheel), power steering, air conditioning, cruise control, power windows, trip computer, AM/FM radio with single CD with MP3 capability and 6 speakers, together with Dynamic Stability Control and airbags (driver and front passenger airbags, front seat side head/thorax airbags and driver knee airbag). 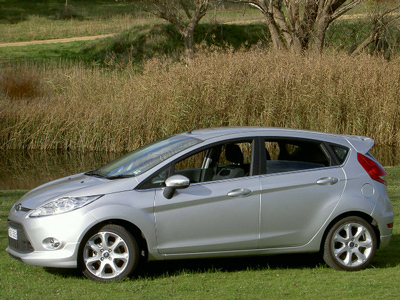 The Fiesta range includes numerous versions. The base model, known as "CL" is available as a 3 door or 5 door hatchback (both are available with either manual or auto transmission). The mid-spec model, known as "LX", is available as a 5 door hatchback only (manual or auto). 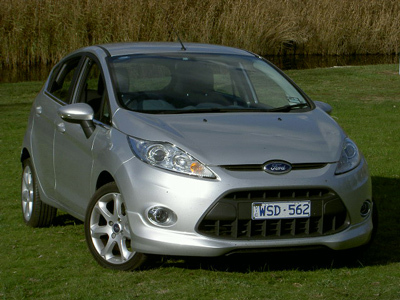 The high-spec model, the "Zetec", is available as a 3 door hatch (manual only) or 5 door hatch (manual or auto). But let us also reveal what is wrong with Fiesta. Foot space for entry/egress to/from the front seats is adequate rather than abundant, whilst the central locking doesn't automatically engage once the car is underway. But as these are the only points for mention it is clear that the new Fiesta is a good design. The Ford Fiesta is very popular in Europe. Our experience suggests it will be popular here too. With trendy styling, a comfortable interior, good fuel consumption figures, enjoyable driving manners and the very worthy Ford heritage it will satisfy many buyers. And the pricing structure is good too!